Welcome to an article on the most important new functionality of SharePoint 2013 and Office 365 site which is none other than “Design Manager”. In this article we will start off with the fourth configuration “Edit Mater Pages”. Here under Edit Mater Pages, you have two functionalities. Convert an HTML file to a SharePoint master page. Create a minimal master page. Here under Convert an HTML file to a SharePoint master page you can upload a html file which the design manager will convert to a master page which you can use on your site. Yes, it’s what you are thinking. When you upload the html file the Design Manager converts that file to a master page if there is no error. If they find any errors, the manager will assist you to help you understand what is causing an issue while converting and you will be able to resolve the issue thereby converting the html file to a SharePoint master page. When you click on, Create a minimal master page. It allows you to directly create a master page by typing in the name and you can create master page directly on one click. Just type in the name and the master page gets created on one click. 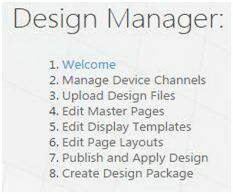 Here we saw today an article on Design Manager in SharePoint 2013 & Office 365 with the fourth configuration panel ‘Edit Master Pages’ on the list. There are more to come. Keep reading and keep learning!